When we had visited Delhi earlier this month, when i mentioned i like this combo, my aunt asked her maid to make it. Mom & I walked it down to this cool organic store called The Roots and bought Maize flour.We devoured the rotis and the Sarson ka saag, and mom decided she wanted to make them once we were back in Chennai. Since there was a packet of flour leftover, we brought it with us and yesterday mom made it for lunch. 1. Add salt and ghee to the flour and mix well till becomes a nice soft dough. 3. Take a plastic sheet and pat the dough on it, making it into a roti [dont make it too thin, it will stick to the sheet]... Alternatively you can roll out each ball between the folds of a greased plastic sheets. 4. 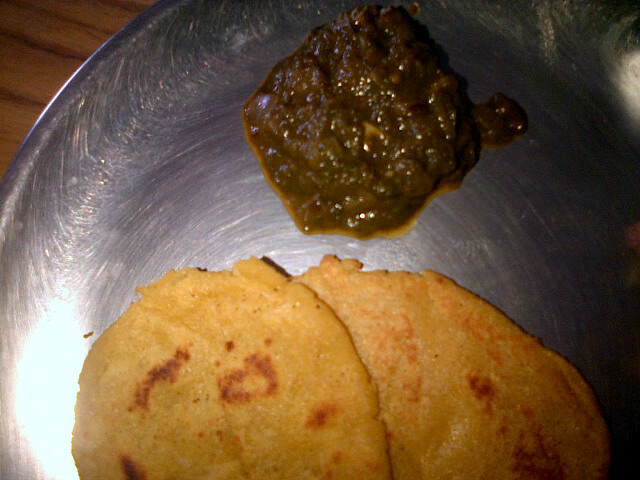 Heat a tawa and cook the roti on it till both sides are done. 5. apply a dollop of butter or ghee and serve hot. You can add palak to make it Palak paneer or potatoes if you desire.